Can the Oakland A’s Win the AL West? Although the game is under protest by the Oakland A’s and manager Bob Melvin, as it stands now, the LA Angels own a 4-3, 10th inning walk-off win against their division rivals. This translates to an 80-53 record for the Angels and a two-game lead over the A’s at 78-55. The game is under protest due to a ninth inning obstruction call that went against Oakland and was upheld by umpire Greg Gibson and crew chief Gerry Davis. Howie Kendrick collected the game-winning RBI with a sacrifice fly in the 10th off A’s reliever Ryan Cook (1-2). The A’s did put up quite a fight in the game, typical of their outstanding season. After struggling through the first three innings, staff ace Sonny Gray retired the next 12 batters to finish with seven innings, allowing three runs off six hits and three walks. Gray’s season record is an impressive 13-7 with 3.03 ERA and 1.21 WHIP over 178 innings pitched. But the A’s are struggling as a team since the All Star break. They are 19-19 since the break and have lost 11 of their last 17. The A’s still maintain a 5-1/2 game lead on the top Wild Card spot over Detroit and Seattle. LA has won seven of ten and appear to be the hot team right now, although the loss of staff ace Garrett Richards could diminish their chances of staying on top. Although the acquisition of starter John Lester from Boston has certainly improved the A’s pitching staff and their team overall, the loss of Yoenis Cespedes has hurt the offense. In 24 games with the Red Sox, Cespedes is batting .280 with four doubles, four home runs and 20 RBI’s. Although not staggering numbers by any stretch, the A’s could use his bat right now. Derek Norris is leading the team offensively with a .270 BA. Josh Donaldson is leading in power numbers with 26 homers and 88 RBI’s, but is only batting .255. The offense will have to pick it up in September to support the pitching staff if they want to challenge the Angels for the AL West crown. The Seattle Mariners have apparently made a decision on their vacant manager’s job. Detroit Tigers’ hitting coach Lloyd McClendon has been tabbed to be the team’s new skipper, per The Puget Sounds Business Journal. McClendon will take over for Eric Wedge, who decided not to come back to the team in 2014 despite the Mariners offering him a contract. Seattle went 213-273 in their three years under Wedge. McClendon, 54, has been a manager before. He managed the Pittsburgh Pirates from 2001-2005. The Bucs went 336-446 under McClendon before he got fired in the final month of the ’05 season. McClendon also played for the Pirates in the final five seasons of his major league career. He was hired by his former manager Jim Leyland to be the hitting coach of the Tigers in 2007. He was a candidate for the Tigers’ job when Leyland stepped down at the end of the season. However, Detroit went with former catcher Brad Ausmus earlier this week. With McClendon now hired by Seattle, it pretty much leaves one managerial opening left. That’s the Chicago Cubs, who appear to be finalizing their decision right now. Previously, it seemed like the lead candidate for the job was San Diego Padres executive, and former Arizona manager, A.J. Hinch. However, in recent days, the club appears to be focused on another member of the Padres, bench coach Rick Renteria. Renteria, 51, played 5 seasons in the majors with the Pirates, Mariners and Florida Marlins. He spent several years managing in the minors for the Padres before being moved up to the major-league coaching staff in 2008. Renteria also managed the Mexican team in the World Baseball Classic earlier this year. Apparently, the Cubs are impressed with Renteria’s ability to work with young players. The major reason given for former manager Dale Sveum’s dismissal was that young players like Starlin Castro and Anthony Rizzo regressed under his watch. The New York Yankees, fighting for a Wild Card spot, made a move Tuesday night to help shore up their defense. The Yanks acquired shortstop Brendan Ryan from the Seattle Mariners for a player to be named later. Since New York got the shortstop after the August 31stroster deadline, Ryan is ineligible to play in the playoffs. However, as the Yankees are in desperate need of solid defense at short and are fighting it out with 4 other teams for the final Wild Card spot, they decided they needed to make a move now. Ryan, 31, is a light-hitting/great-defense shortstop. This year, in 87 games, he’s only hitting .192/.254/.265 with 3 HRs and 21 RBI. Career, his numbers aren’t much better, as he’s at .238/.300/.320. However, he is a plus defender at short with excellent range and good instincts. He gives the Yankees marked improvement in that area over the final 3 weeks of the season, as Derek Jeter has been out most of the season and can’t seem to stay healthy down the stretch, and Eduardo Nunez has been a disaster defensively at short. Nunez has played 78 games at shortstop this season, making 12 errors and posting some of the worst fielding range numbers in the majors. Even when Jeter has been able to play, he hasn’t provided the Yankees with much. His range at short, already sub-par before the injuries, is non-existent now. With the bat, he has been awful, batting .190/.288/.254 with 1 HR in 17 games. He hasn’t given the Yankees any value so far this year. While he might be able to provide a little bit more at the plate than he has so far, age combined with injuries make him a liability at shortstop. Ryan provides some insurance during this stretch run. Even if Jeter can play in most, or even some, of the games going forward, Ryan will be inserted as a defensive replacement late in games. Currently, the Yankees are two games out of the final Wild Card spot. Tampa Bay currently holds the final spot, but has struggled lately, making the race extremely tight. Baltimore, Cleveland and Kansas City are all within three games of the Rays. In the past few weeks, New York has gotten a boost from Alonso Soriano and Alex Rodriguez. Soriano was acquired from the Cub right before the trade deadline and has crushed 15 HRs in 43 games. 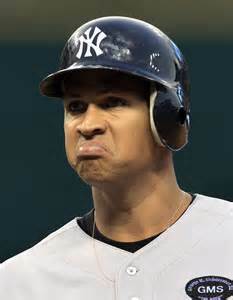 A-Rod missed the entire first half of the season after hip surgery and has hit .301/.388/.496 with 5 HRs in 31 games. Of course, he also received a 211-game suspension that he is currently appealing and he’s also filed lawsuits and grievances towards the Yankees and their medical staff. One could say that the Yankees shouldn’t be benefitting down the stretch from a player that will surely be serving a lengthy suspension, but that is another article for another day. MLB Suspensions To Be Announced By Monday; A-Rod To Get Lifetime Ban? It appears that MLB will announce the suspensions of the players involved with Biogenesis by Monday. The eight players that are not Alex Rodriguez are expected to get 50-game suspensions. It is unlikely that any of them will appeal the suspensions. As for A-Rod, there are varying reports coming out stating that he is trying to come to a settlement with MLB on the length of his suspension. The main reason that MLB wants to get the suspensions announced no later than Monday is timing. If they wait much longer, players will have to serve some of their suspension in 2014. Two players, Tigers shortstop Jhonny Peralta and Rangers outfielder Nelson Cruz, are key members of teams in pennant races, and would like to be able to get their suspensions over with before the playoffs start. If the suspensions come out over the weekend or even by Monday, then they will be available, assuming the suspensions are at the expected 50 games. As for the continuing A-Rod saga, his representatives and MLB officials have been talking over the last couple of days to see what kind of suspension they can both come to an agreement to. This at least showed that Rodriguez might allow some kind of suspension to be handed down without appealing or fighting it. However, it appears that A-Rod and MLB are really far apart. Apparently, Rodriguez is willing to accept the same 50-game suspension that the other players are getting, and nothing more. MLB is threatening a lifetime ban and, at the very least, wants A-Rod to sit-out the rest of 2013 and all of 2014. As I’ve stated numerous times on this site, A-Rod isn’t going to go quietly. He has too much money owed him over the next 4+ years to just roll over. And, while MLB has stated that the Yankees are not involved whatsoever in these negotiations and that A-Rod’s current contract has no bearing on any possible discipline coming his way, that’s all just smoke being blown up our collective asses. The Yankees are hoping that MLB will do them a huge favor and get them out of the rest of A-Rod’s mega-contract. And as Bud Selig works for the owners, and is a former owner himself, he will do his best to make the marquee franchise in baseball happy. What do I think will happen this weekend with A-Rod and MLB? I think Selig is going to hammer A-Rod with a lengthy suspension, most likely a lifetime ban. 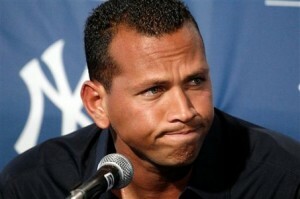 They are willing to let A-Rod do a suspension through 2014, but there is no way he will accept something like that. Anything over the 50 games that the other players will receive will bring about a lengthy fight from Rodriguez, one that will take up a lot of press and extend for months. We are going to be dealing with this for a long time, folks.